The Arch/Y Bwa at Ystwyth Forest (NRW)0300 065 3000workViewpoint/Beauty SpotThe Arch Woodland Trail (1 mile, 1.6 kilometres). The old masonry arch spanning the road was built by Thomas Johnes of Hafod in 1810 to mark the Golden Jubilee of George III. This corner of the old Hafod estate offers a range of trails to suit all tastes. The viewpoint from the Panorama Walk is one of the most inspiring in Mid Wales. The Pwllpeiran Trail gives an insight into the cultural landscape and heritage of the area with good views of the Upper Ystwyth Valley and the Hafod estate. 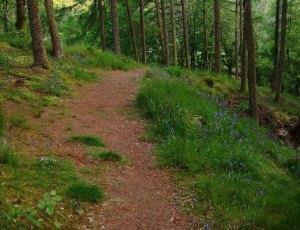 Why not also visit the nearby scenic Hafod Estate, famous for its Picturesque landscape, where five waymarked trails await you. Take the B4574 from Devil's Bridge to Cwmystwyth. The car park and picnic area is just after the stone arch on the left, approximately 3 kilometres from Devil's Bridge. The Arch Woodland Trail (1 mile, 1.6 kilometres).